Great Britain - the decision was made quickly. With so many itchy feet in our household, it came as no surprise to our friends and family. The highlight of the trip was to be the football match between Scotland and Croatia in Glasgow - well, for the male travelers in our party. We, the ladies, decided to go shopping, since that is our favorite pastime activity. But let me begin with our flight to London where the seven of us headed early on Easter morning. The flight was not full so we boarded the plane without any problems. To my boys' great delight, the coach of the Croatian national team was on the same flight together with his assistants. Of course, the autographs were asked for. After landing in London we rented a Kia Sedona with seven seats. . 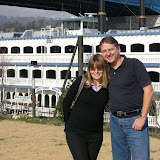 I've just uploaded photos taken in Tennessee, the Volunteer State. More about Memphis, Nashville and Chattanooga. Pics from Tupelo, where Elvis was born and Memphis, where he lived. 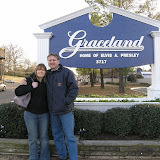 If you want, you can read my post on Graceland here.